Our instructions are based on Adobe Photoshop. If you do not use Photoshop, please use whatever settings are similar in your program. Begin with a canvas that is 3.75 x 2.25 inches in size. Drag guides out of the rulers to 1/8th inch from each edge and then 1/4 of an inch from each edge. This indicates the bleeds and margins. After you are done ensure your image is in CMYK color mode and flatten your image (no layers). Select save and change the format to tiff. Make sure you uncheck the layers and color profiles checkboxes. 3. Set the additional tiff options. After you click on [save], this window should come up. Please select LZW compression. 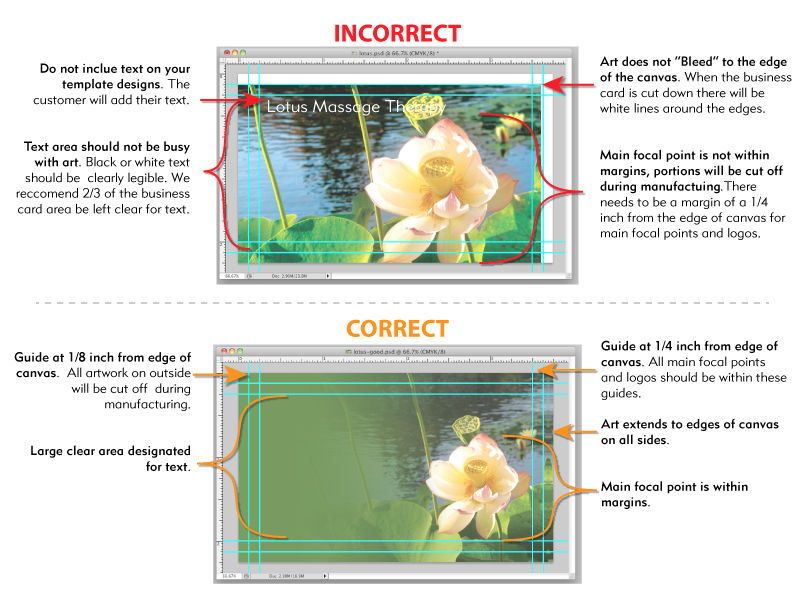 You should also look at the layer compression area to ensure it is grayed out. Please follow these directions as the files are going into an automated system. You can upload your finished files on the Template Upload .